Ladies GAP Stretch Size Small Blouse. Condition is New with tags. Smart blue blouse/ shirt fit for any girls wardrobe. 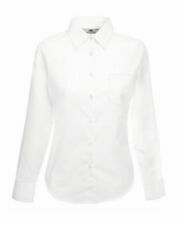 Buttoned front with fold back cuffs and double buttoning fastening. A great buy! Women's Off Shoulder Tops Ladies Summer Casual Loose Blue Cotton Blouse. Condition is New with tags. Dispatched with Royal Mail 2nd Class. Scoop neck with long ties. Small spot pattern. Good quality garment, new with tags. Original with labels sorry should add some photos or please request by contacting me. Ladies Brand New With Tags Black Calvin Klein Top TK Maxx. Black material with silver dragon to the front of the top. CK Jeans, front zip to the collar. Dispatched with Royal Mail 1st Class. White top size is small /Xs. Burgundy Blouse With Frill And Cold Shoukders Size 14-16 Avon. Condition is Used. Dispatched with Royal Mail 2nd Class. Stunning Minuet Navy Blue Blouse Size UK 12. Dispatched with Royal Mail 1st Class. Used but in excellent condition with no defects no pulls no stains clean. Bust measurement is 38in length is 21.5in. Summer Strappy Top Size 16. Condition is Used. Dispatched with Royal Mail 2nd class. Short strapped top with lace on the front. Debenhams Petite size 12 Blouse. Condition is New with tags. Never worn as seen in the pictures. I washed it to freshen it up and the price tag came off in the wash as seen. Lovely fitted blouse as it contains elastine. Dispatched with Royal Mail 2nd Class. Top to Bottom - 23". Overall sleeve Length - 22". There may be a little bobbling or a few loose threads, but if there are any other larger problems, I will be very happy to help solve the issue MISTAKES DO HAPPEN. Has patch pockets to front. Fabulous Crew clothing co /white/blue stripe ladies long sleeve rugby top with pockets Size..8).. Condition is Used. Dispatched with Royal Mail 2nd Class. Wallis floral top size 16 petite. Condition is New with tags, cost £20. Blue and purple flowers, buttons to back to fasten. Dispatched with Royal Mail 2nd Class. Inside there is a plastic bag with a spare button still attached to the inside hem. Fresh and crisp. The fabric is 52% linen and 48% viscose. It has a creamy beige background with a retro spot pattern of black and orange almost like an animal print. Vintage bright Blue Denim Jacket. Condition is Hardly Worn. Dispatched with Royal Mail 2nd Class. Pretty MINUET PETITE oyster beige linen blend shawl collar cardigan with 3/4 length sleeves. Size L would fit 10’ 12, 14 as it has no fastening. TWIN TIPPED COLLAR & CUFFS IN MAROON & WHITE. UK 12/ EUR 40/ USA 8/ JAPAN 13 22" IN LENGTH. 18" FROM ARMPIT TO ARMPIT. 15" FROM SHOULDER TO SHOULDER. Blouse Fitted - Gap Stretch. Popper fasteners down the front and sleeve cuffs. Never worn as sizing wrong and was a gift so didn’t want to offend! Very versatile garment for casual or smart wear. Great addition to any girls wardrobe. Basic polycotton top in a navy and red stripe from M & S. Hip length with 3/4 sleeves and scoop neck. 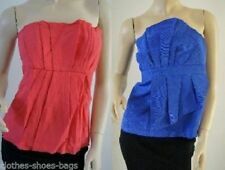 2 Womens Short Sleeve Tops . Dispatched with Royal Mail 2nd Class. This lovely red and white jacket, made in Copenhagen by Designers Edith and Ella. It is fully lined and finished to a high standard. The collar, faux pockets and hem have a winter white trimming again in satined cotton. MARKS AND SPENCER SIZE 16 petite BLACK / WHITE CHECK TOP SHIRT BLOUSEWorn once. Condition is Used. Dispatched with Royal Mail 2nd Class.l lovely and soft. Looks great with anything. .